Native American Indians were a deeply spiritual people and they communicated their history, thoughts, ideas and dreams from generation to generation through Symbols and Signs such as the Brothers symbol. The Brothers symbol featured in the ancient Mississippian culture of North America, the culture of the Mound Builders. The Mound Builders associated great mystical value to Brothers, especially twin brothers, who strongly featured in their myths and legends. The sacred rites, myths and symbols of the Mississippians play a role in the beliefs of many Native American tribes. The Brothers symbol is depicted as a pictogram in many Native American cultures. A pictogram, also called a pictograph, conveys a story and meaning through pictures that signify and resemble the shapes of physical objects or people. An Ideagram is another form of pictogram which conveys complex ideas, feelings and emotions. A pictogram, such as the one recognised as a Brothers symbol, is a therefore a form of writing which uses representational, pictorial drawings to tell a story. For additional information refer to the Family Symbol. The Brothers symbol is also depicted within a circle. 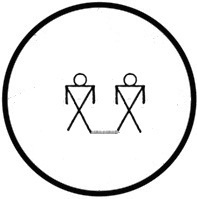 The symbol of the brothers depict two men who are positioned side-by-side which represents unity and equality. The line connecting the symbols of the men indicates that they are brothers who are bonded together and share a journey through life. Should one man symbol be positioned above the other this may be interpreted as a symbol for a father. The Brothers symbol may be used to indicate two men who are not related by birth who have sworn loyalty to each other. This is usually done in a ceremony, known as a blood oath, where the blood of each man is mingled together making them relatives. Among the Lakota Sioux, two men who had made a life long pledge of friendship to each other might express this relationship by marrying sisters and exchanging wives on certain occasions, refer to the Sisters symbol. Among the Pawnee tribe, brothers sometimes shared their wives and it was not uncommon for two or more brothers to set up a joint household, sharing both their wives and their property. The Mississippian culture dates back to the ancient indigenous population of North America. Our grasp of Mississippian symbolism is only rudimentary. Their true meanings can never really be known and the meanings of the symbols are based on best guesses. Traditionally twin brothers illustrate the concept of duality and balance. The dual roles of bothers depicted as good and evil and light and dark. The Brothers symbol is depicted in almost every creation story among the Native American Indians. The brothers symbol as depicted in the Mississippian culture of the Mound Builders are also referred to as a heroes in Siouan traditions. The brothers are the sons of the deity Red Horn and strongly feature in the creation myth in the role of protectors. As hero figures the brothers overcame great odds to protect the people from enemies, monsters, animals, floods, drought and many other problems. The brothers symbol shows them wearing the 'Forked Eye' surround motif indicating their residence on Earth between the Upperworld and the Underworld.